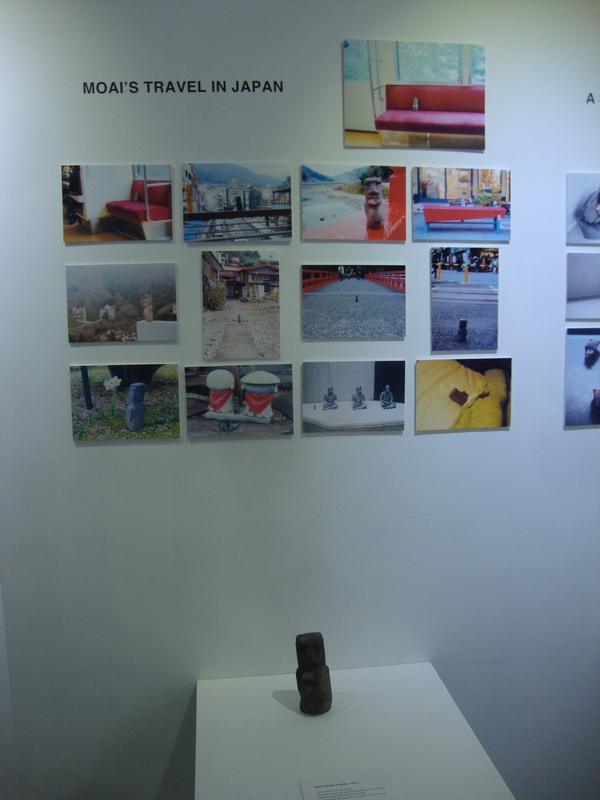 Yesterday I found myself, for the first time, in ICN Gallery on Leonard Street. The Gallery had two shows on display; its main exhibition was a collection of work by Japanese artist Riusuke Fukahori whilst in the basement gallery was the work of Yoriko Tsukagoshi. 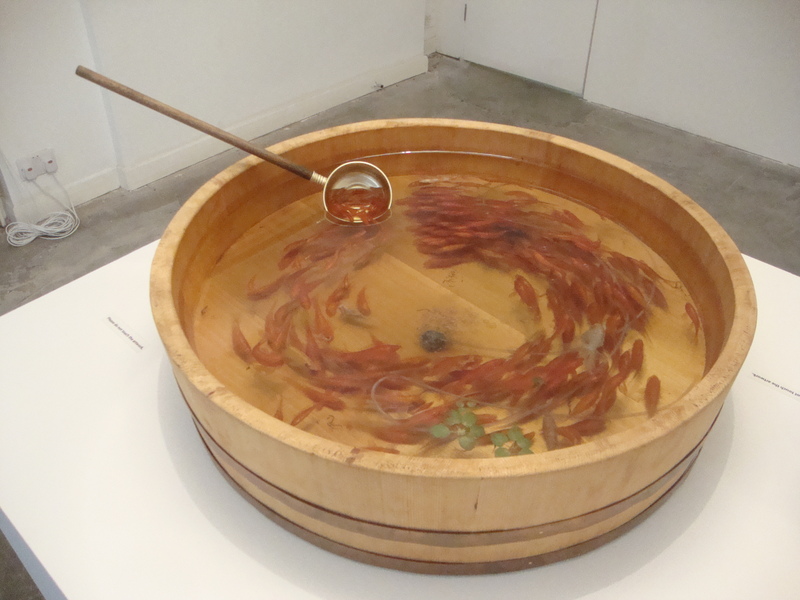 In the main space Riusuke Fukahori’s work’s subject matter was that of the humble Goldfish. This exhibition is the artist’s debut exhibition in London. His Goldfish theme has ran throughout the work he has produced during his artistic lifetime. These pieces and this theme came about after Fukahori suffered an artistic drought. All of a sudden this drought ended when he began to become obsessed with his pet Goldfish which, sadly, had been neglected (and yet was still alive) for seven years. He looked down into the fish tank which he abandoned cleaning and was given a breathtaking shiver. In the dirty water the goldfish’s shiny red silhouette moved mysteriously and was extremely beautiful. He took out his red paint and painted her figure. This was the day he calls ‘Kingyo sukui’, the day he was saved by the goldfish. Developing a new passion for his goldfish he developed a unique style of painting. He uses acrylic painted on clear resin poured into containers, resulting in a three-dimensional appearance. The fish painted in the resin are frozen in time. 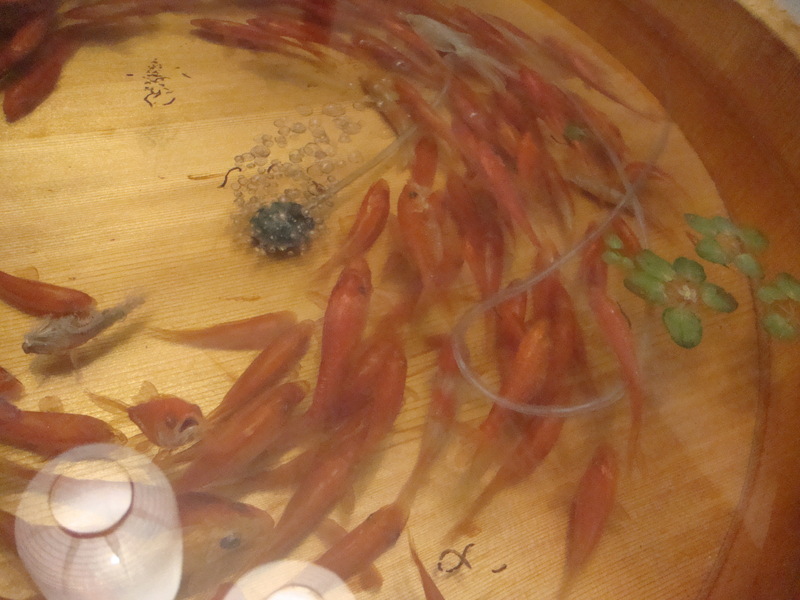 It seems that the fish have been forever captured unaware in the resin that Fukahori has used. Fukahori captures these fish in traditional staples of Japanese Culture. His small painted fish appear in Sake cups, Sushi -basins and rice measures. As well as appearing in these objects, Fukahori has painted his fish on to large canvases that perfectly fill the large white walls of the gallery. 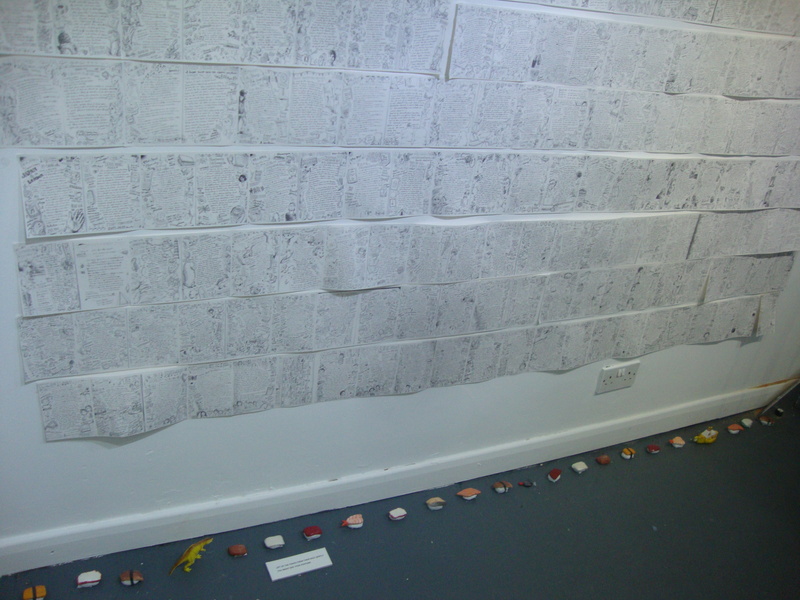 The pieces that rest on plinths littered around the gallery encourage the viewer to engage with them. I was pulled in and found myself almost dipping my nose into the resin to get a close look at the wonderfully detailed fish. The canvases on the wall had an almost spectral quantity. I found myself transfixed with their wonderful colours that sent out an astronomical feeling. The colours could be used to create paintings of deliriously delicious scenes of solar systems. I never thought I could get such entertainment from Goldfish. Fukahori’s art works, because of their constrained theme and his impressive talent, the artist has produced a body of work that is engaging, exciting and impressive. He has made a pet that has been artificially bred on a mass scale and made it unique. 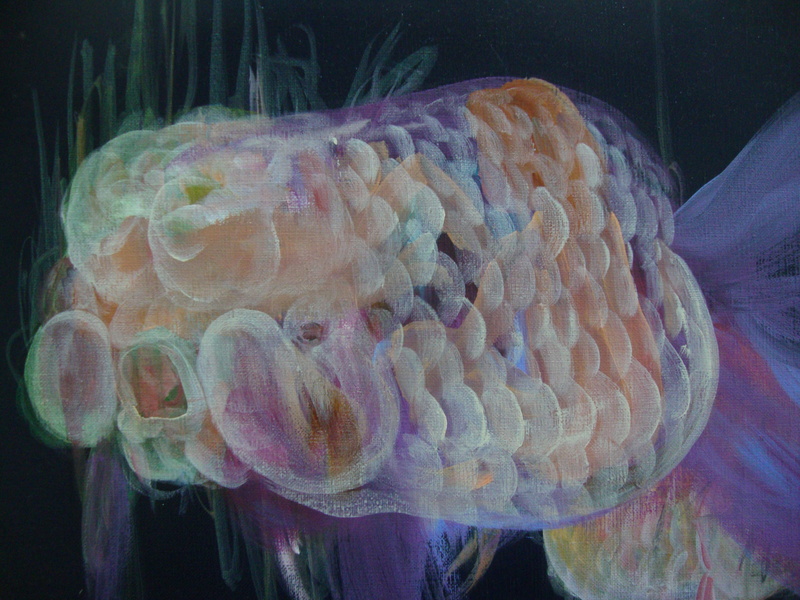 Even with many of his pieces containing many Goldfish, each one engages the viewer personally. This is what makes his work so impressive. In the small basement gallery, fellow Japanese artist Yoriko Tsukagoshi appears featuring a body of work titled ‘NEWMOR’ that she has created over the past five years. This young artist, just 24, graduated from Kuwasawa Design School in 2009 and is now studying at London’s prestigious Central Saint Martin’s. Fun and playful, Tsukagoshi’s work engages with the public with her miniature designs. As you descend the metal stairs into her space, you are lead by the ‘Sushi March’. Here she has created tiny pieces of sushi that exit from a pair of sliding doors. She describes these pieces of Sushi as a part of Japan’s national identity. She describes the Sushi as Japan marching forward into the future with hope. Tsukagoshi has a terrific imagination that is entertaining and light. You can tell that she gets a great sense of joy from the often comical pieces that she has created. From the adventures of her miniature paper model Shiba dog who dreams of being a pilot to Moai’s (the Easter Island stone statue) exploration of Japan the viewer can sense Tsukagoshi’s childlike joy in her pieces. These miniature adventures are reminiscent of street artist Slinkachu’s miniature street sculptures. A main difference would be whereas Slinkachu places his characters in mortal danger or in melancholic scenes, Tsukagoshi places hers in a world of fun that is entertaining and humorous. Entertaining, and at times random, Tsukagoshi’s work is a delight. 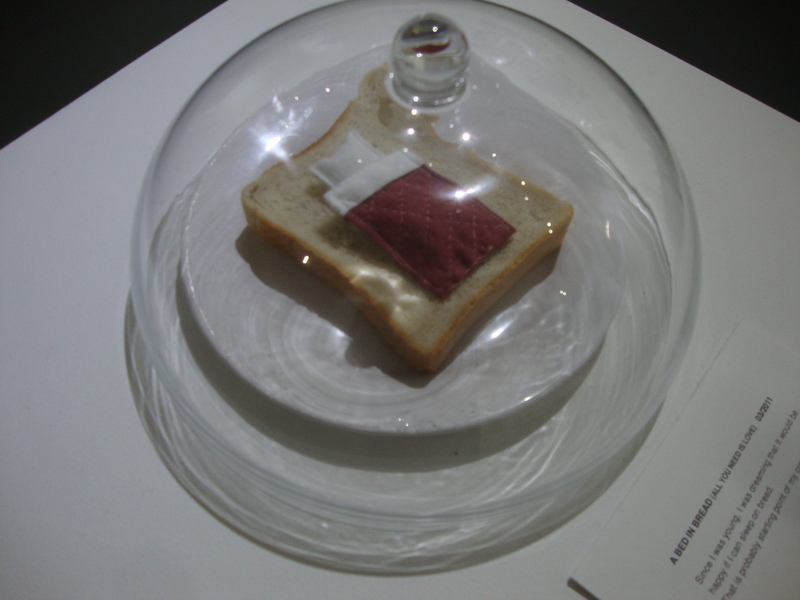 Her dreams of dreaming on a piece of bread are reflected in her piece ‘A Bed in Bread’. 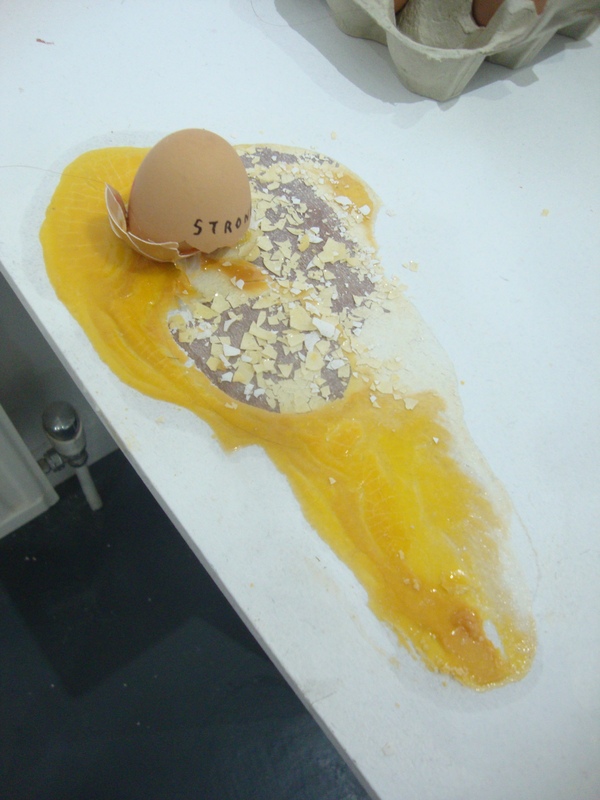 The only sign of melancholia appearing in her show comes in the form of her ‘Egg’s Dream of the Future’. Here most would believe with the eggs being labeled ‘Strong’ that they were untapped potential as they had not be fertilized, however, Tsukagoshi turns this around and claims that their destiny is to become an egg. This was always the plan. It has a positive feel, they were born eggs they will stay eggs and will dream of their futures as eggs. I was very impressed with both shows and they are definitely worth a visit. 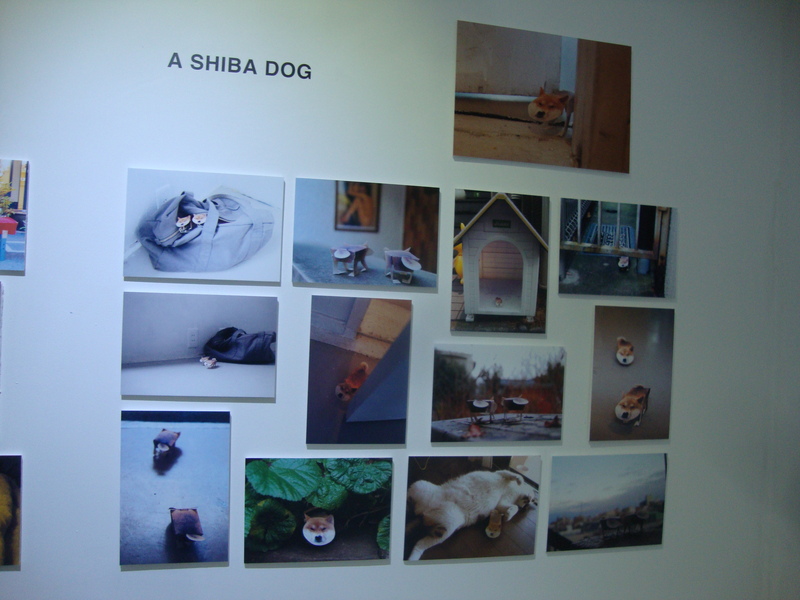 Tsukagoshi’s exhibition is only on until Thursday, I urge you to get down there. Fukahori’s runs until early January. I look forward to seeing what direction Tsukagoshi’s work takes in the future.